Tonight I grilled a pork loin with a bacon weave and sauced it with Allegro Barbecue Sauce. 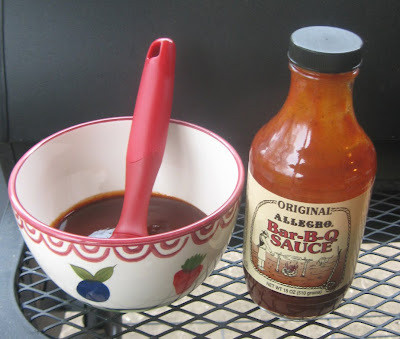 I've not tried the Allegro BBQ sauces. In fact, I just learned about this company when I got a marinade they make with my birthday gift certificate from my son. The company saw my review and that I can't find the products here, so they sent me some samples to try out. IGA had a good sale on pork loins this week, and we do love those. I decided I'd get a small one and do a bacon weave and then sauce the pork loin with the Allegro Original barbecue sauce. They have a hot version too, but my younger son is not real big on hot foods. He did not get that from his Mom I can tell you for sure. I put my pork loin on the preheated grill (heating it helps prevent sticking), but this is an infrared grill, so even though I heated and then left the lid open 5 minutes or so, this was one hot grill. For a pork loin, you want lower and slower, so a smoker or an offset would be a better idea. I can handle it. I did babysit the grill and went with the lid up and down to keep the temperatures down lower. Mostly I ended up sitting at 350 degrees F but with some spikes I had to watch. I would normally go lower, but I was asking a grill to do what a true grill is not designed to do. 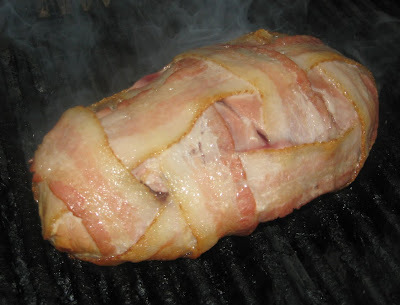 In any case, the bacon quickly shrunk and stuck tight as it should which then makes it easier to work a bacon weaved anything on a grill or smoker. 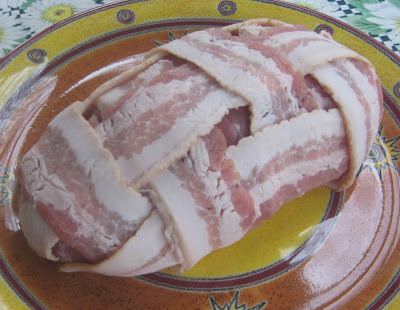 Once that bacon "sets," then you can turn the meat as you like, and it's easy to work with. 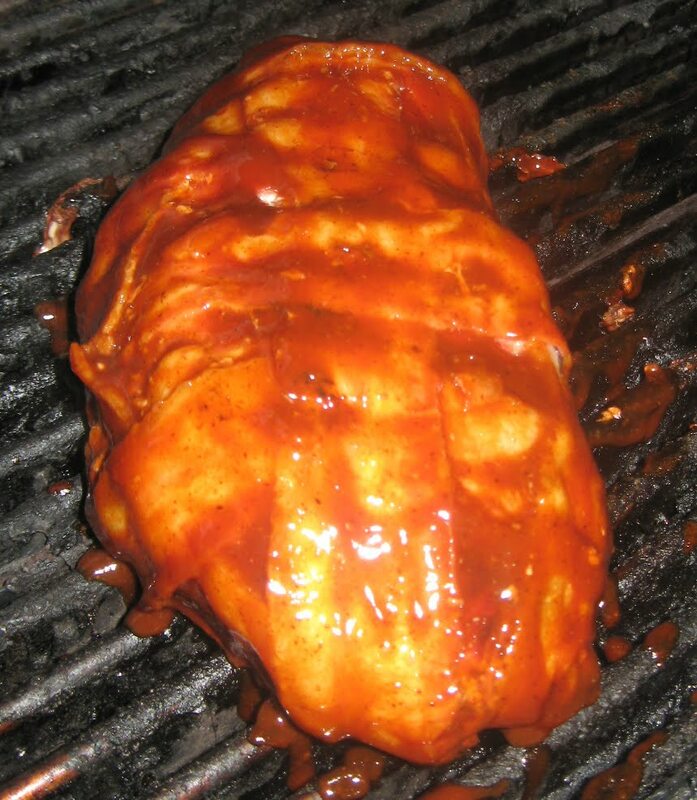 When the grilled pork loin hit 140 degrees (on my Taylor thermometer - low tech but I love it), I hit the pork loin with the Allegro Original BBQ sauce. I lathered it up good and flipped it and did the top as well. It was close done, and I just needed the sauce to heat and caramelize. It was cold out tonight, but it took around 15 minutes for the sauce to set up right and for the pork loin temperature to hit 155 degrees F. I often pull pork loin at 150, but since it was a cold night, I went a little higher. The end temperature you want per government recommendations is 160. The meat cooks on a bit after you take it off, so you want to go a little lower when you pull the meat. Yum! That Pork Loin Was Fabulous. After letting the bacon wrapped pork loin with Allegro Barbecue sauce rest about 10 minutes, I sliced it. I had mine plain, but the guys had their sliced pork on buns as sandwiches. The flavor was excellent. Next time, I might add some seasonings or marinade to the meat, but I wanted the full effect of the Allegro sauce tonight. It was very good. 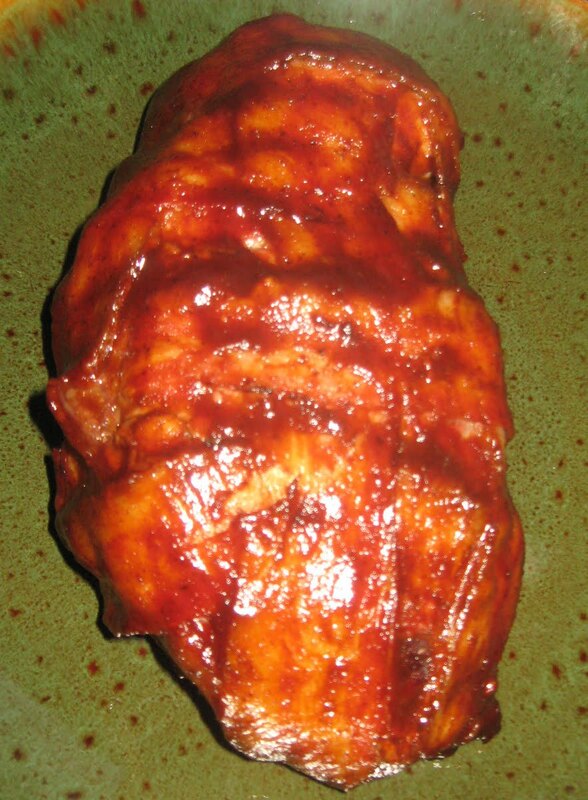 It is a barbecue sauce that you could serve to any family or friend group. It's not over the top on anything but has a really smooth flavor. I'm looking forward to the spicey Allegro BBQ sauce. I love the heat. I can picture the extra heat in my mind on this one. Yum boy. I'd be more likely to use Allegro Original, because you never know about your guests, but I'm going to hit mine with some hot stuff soon, and I'll let you know how that goes. I'm guessing really great, since I've loved all the Alllegro products I've tried so far. 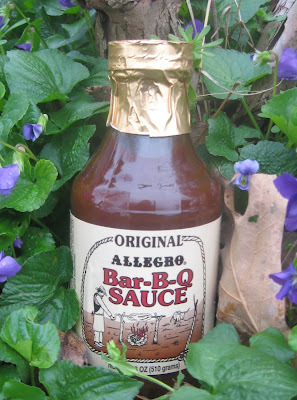 I think Food Lion (our local grocery chain) needs to add these Allegro products to their barbecue section.